In just a few days it will officially be Spring, regardless of what the thermometer says. As I sit here writing this post, snow is in the forecast for central and southern Indiana. Living in central Indiana, you can never depend on the weather in October (or March for that matter!) It could be warm during the day but drop down into the 30s at night. Yet, every year, I get calls in late October from homeowners asking if it’s too late to paint the exterior of their homes. 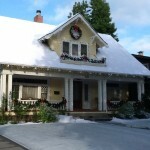 Craftsman Painted in Spring 2012; Decked for the Holidays! I like to have my exterior painting projects completed by late September. In most cases, if the temperature falls below 45 degrees, paint won’t cure properly and loses some of its long-term durability to protect your home from the elements. Most high quality high-end paints require a minimum of 54 degrees to cure properly to give you the finish you expect. Now is the time to get the estimates and get on the paint company’s schedule for exterior as well as interior painting. One last word of advice – if your house was built before 1978, the EPA RRP Rule (Renovate, Repair, Paint) must be followed by the paint company you hire. If the painting company representative does not explain the EPA RRP Rule to you during your estimate, he/she is in violation of federal law – find another painting company. Posted on Sunday, March 17th, 2013 at 10:48 am	under EPA rule for renovation, Exterior Painting, Hiring a Painting Contractor, Indianapolis Painting Contractor, Interior Painting, Uncategorized. Follow any responses through the RSS 2.0 feed. You can leave a response, or trackback from your own site.